The recent wet weekend brought a repeat of the old drains problems - with stormwater surcharging the sewers and pushing raw sewage up through manholes at the lower end of the village. will add to the problem. The Parish Council has continually raised this problem with the relevant authorities. It also made the strongest possible representations to Tewkesbury Borough Council against allowing more houses to add their sewage and storm water to make the problem worse. It was all to no avail, as Tewkesbury are under such pressure from central government to give permission for extra houses. 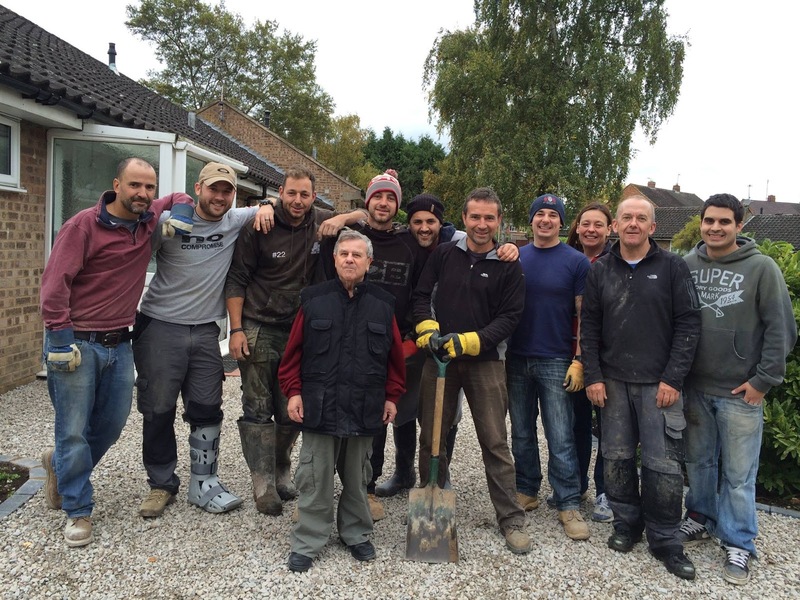 After hearing about an elderly gentlemen in Cheltenham who was recently the victim of rogue traders, and as a result lost his life savings and was left with a dangerous and unsightly driveway, the guys of Maisemore FC felt compelled to offer their help and support to put things right. Darrell Hobbs, Debbie Lancett, Kim Powell and Aaron Boote. The team gathered at the White Hart Inn at 7:30am on Saturday 17th October and headed over to Cheltenham in a convoy of vehicles - which included a John Deere tractor kindly supplied by Dirtworks of Maisemore. Jay Bubb and Ashley Tipping led the operation, providing some much needed expertise, supported by a rabble of enthusiastic (if not all that able!) men. Since these men are usually to be found sat behind a desk, it’s fair to say that Jay and Ash were pleased to at least have the experience of Tim Bloxham and Kim Powell in the team! Like every good army, every good ground works team relies on a full stomach! Breakfast consisted of the finest bacon and sausage rolls, generously donated by Gurneys Butchers and perfectly prepared by Debbie Lancett, who was later to be seen joining in the fun, swinging a sledgehammer with alarming vigour! The morning wasn’t exactly incident free, with some mechanical failures as well as, perhaps unsurprisingly, a few human failures too (we won’t mention any names, Darren Hobbs knows what he did!). But, only seven short hours later, the job was completed, and a lovely elderly gentlemen had had his faith in human nature restored. It was a fantastic day and everyone involved had a brilliant time. The day was followed by a great evening in the local pub with delicious curry kindly donated by the team at the White Hart (many thanks go to Kesh, Bimal, and Dev) and a bottle of bubbly courtesy of Phil. When setting up Maisemore FC last year, I never imagined that such good would come of it, and I’m extremely proud of the whole team. My sincere thanks go to everyone involved, as follows: Jay Bubb, Ashley Tipping, Debbie Lancett, Kim Powell, Adam Causon, Aaron Boote, Tim Bloxham, Ed Knight, and Darrell Hobbs. My thanks also to the local businesses that provided materials, equipment, and refreshments, as follows: James Bubb Landscaping, Dirtworks, Complete Irrigation, Gurneys Butchers, QA, and of course The White Hart. Additionally, I would like to publicly thank B&Q who willingly provided materials at a significantly discounted rate. Finally, weekend family time is extremely precious, so my thanks to all the wives and children who lent me their husbands and fathers for the day. 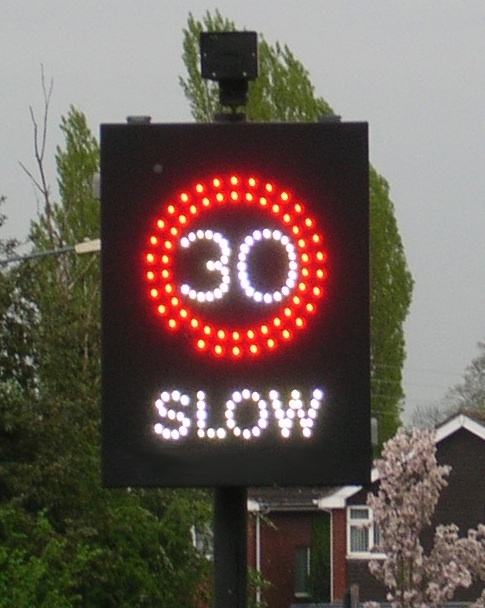 The Parish Council has learned from the County Council that the poles have been ordered for vehicle activated speeding signs in the village. The poles are being part-funded from County Cllr. Phil Awford's community budget and part by the Parish Council. The plan is for four poles in the village, and the sign will be moved from pole to pole, with variable displays to get the greatest impact. The location of the poles has been decided in discussions between the County Council and Parish Council, and these are shown on a plan of the village here. There was a small but very significant misprint in the latest issue of Grapevine. It said that the Parish Counil had not raised any objections to the proposed development at Rectory Farm. In fact, a detailed representation was made following the well-attended PC meeting. This representation is on the Tewkesbury Borough Council website and can be seen here. Does your hedge need a haircut? Some hedges in the village are getting a bit too big for their boots! The Parish Council has been asked to remind residents that, if their hedge borders a pavement or footpath, it needs to be kept in check so that people can walk freely without brushing against the hedge. This can be an even bigger problem for anyone with a pushchair or using a wheelchair - and there are now a few spots in the village where such users are unable to get past without going on to the road. So please take a look at your boundary hedge. If it overhangs the pavement, then there should be at least 2metres (6ft 6in) headroom from the pavement surface and, where the pavement permits, a clear width of at least 0.9metres (3ft). The Parish Council has written to Tewkesbury Borough Council to express its dismay at the 'delegated permit' decision on the planning application for 15 houses on the Bell Farm site. being lifted by storm water. The key issue is the fact that this development would be connected to the existing sewers, which Severn Trent have told the Parish Council are already at capacity. Although the increase in the volume of sewage may not be great (around 10%), there is already a problem with manhole covers being lifted at times of heavy rain. 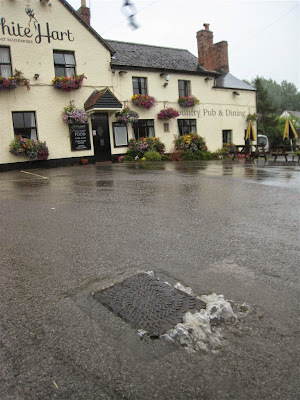 This is because there is a linkage somewhere in the village between storm water drains and the sewers, so it is the storm water that surcharges the sewers and force the manhole covers up, allowing untreated sewage to flow on to the roads - mainly at the A417 junction with The Rudge and in the car park of the White Hart. It is believed that an inch (25mm) of rain could put nearly 1 million litres of water into the system, running off from the roads, pavements and the roofs and drives of houses. Please help us to remind residents who want have their say and vote in the upcoming elections that they need to make sure their names are included on the electoral register. Alongside the general election, local elections will take place in Tewkesbury Borough on 7 May and notices seeking candidates in all of the borough’s 22 wards and 43 parish/town councils have been posted throughout the area - including on Maisemore Village Hall notice board. • Postal voting applications 5pm on 21 April 2015. • Proxy voting applications 5pm on 28 April 2015. Anyone who wants to stand for election can get a nomination pack from our offices in Gloucester Road, or from their local parish office or clerk. Nominations for candidates will close at 4pm on 9 April. Nomination forms can be downloaded here. For more information on standing for election, the voting process on 7 May or checking whether you are on the Electoral Register, please email elections@tewkesbury.gov.uk or phone 01684 272025. A major funding bid by Gloucester County Council for major improvements to the A417 designed to reduce the risk of flooding has not been successful. Maisemore Parish Council supported the bid, details of which can be found here.